In December of 2005, a two-month-old bottlenose calf was found entangled in a crab trap off the east coast of Florida. 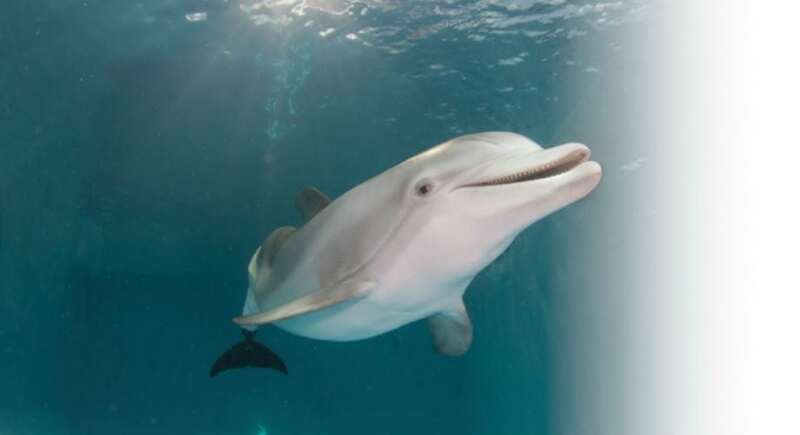 “Winter,” as the dolphin would soon be named, was eventually rescued through joint efforts by the Harbor Branch Institute, the Hubbs-Seaworld Research Institute, and the Clearwater Marine Aquarium (CMA), where she was transferred for medical care and management. The rescue proved to be just one of Winter’s many hurdles. While Winter was trapped, the ropes cut off all circulation to her tail, and although the CMA worked tirelessly to promote healing in the area, they were unable to save it. This resulted in Winter developing a modified swimming pattern, which put her at risk of developing degenerative changes in her spine such as scoliosis. Winter’s medical team and caregivers had to come together to find a solution. It was then that Kevin Carroll, vice president of prosthetics at the Hanger Clinic, took an interest in Winter’s story. He decided to take on Winter as a patient for life and proposed the development of a prosthetic tail. “What we knew was that if Winter wasn’t going to accept the tail – if it wasn’t comfortable for her; if it created any discomfort; if it was awkward – she wasn’t going to accept it and she wasn’t going to use it,” Stone said. Part of the issue is that dolphins have very delicate skin, and it took several iterations of the prosthetic before this could be worked out. Carroll suggested that they use a custom-fitted sleeve as opposed to a generic one. This sleeve incorporated a thicker silicone gel that had not yet been used in prosthetics, now called WintersGel. Her prosthetic tail incorporates the use of a secondary sleeve that fits over a brace, mimicking the presence of a joint. Winter must still undergo a variety of daily therapies to prevent further degenerative changes. However, some question the reasoning behind spending so much time and effort on one dolphin. “There’s lots of reasons why,” Stone said. “Ethically, we’re helping a baby dolphin that was injured because of people’s lack of awareness…We felt obligated to assist an animal that was in that situation because of humans.” In addition, she said, it helped lead to advances in prosthetics not only for animals but for humans. WintersGel, for example, is now being used by the Hanger Clinic to assist human patients who experience discomfort when wearing their own prosthetics. “People are walking now who were not able to walk before because of WintersGel,” Stone said. However, the story of Winter doesn’t end there. CMA’s Education Department, which has robust STEM-based offerings ranging from Pre-K through High School, has integrated a number of initiatives based on Winter’s journey. At the very place Winter received her vital prosthetic, students engage in education based on real-world scenarios. The “Operation: Winter’s Tail” program challenges students to devise their own engineering ideas for a prosthetic tail while also discussing the chemistry of WintersGel and the physics behind her prosthetic tail design. However, Winter’s influence doesn’t end there, with another program based on events from the movie Dolphin Tale in Tracking Hurricane LeRoy. This program emphasizes math skills as students take on the role of a meteorologist to track hurricanes while learning the physics behind storms. Outside of the CMA’s Winter-inspired efforts, they offer plenty of compelling outlets for STEM students and aspiring marine biologists alike. During the “Water Quality” program, students perform the same water quality tests as aquarium personnel, as they discover how water chemistry effects biological organisms. Meanwhile, weeklong summer camps help students engage in rescue protocols utilized by the Aquarium’s Rescue Team. During “mock stranding” programs, the students use math skills to take weights, calculate dietary needs, perform precise measurements, and learn about veterinary science. Between the creation of WintersGel, the popular film based on her life, and the STEM programs inspired by her adventures, the journey of Winter continues to be influential for adults and children alike. While it was by no means an easy task, Winter’s rescue and the heroic efforts by the Clearwater Marine Aquarium will serve as inspiration for years to come. Clearwater Marine Aquarium works not only to provide Winter the Dolphin with adequate care, but also to foster an interest in science, technology, and the environment in the younger generation. Using Winter’s journey as an inspiration, the CMA offers several STEM programs for students in Pre-K all the way up through High School.